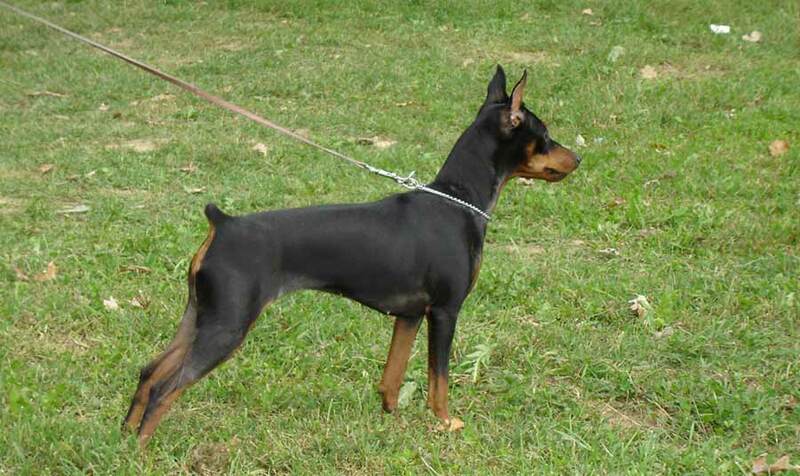 Miniature Pinscher, a German breed is several hundred years old, and although it resembles the much younger Doberman Pinscher, they are not related. Breed experts say these small dogs, developed as ratters, have German Pinschers, Dachshunds, and Italian Greyhounds in their ancestry. Miniature Pinschers stand between 10 and 12.5 inches tall and weigh between 8 and 11 pounds. The head is tapered, eyes are oval and dark, and ears are cropped upright or left natural. The body is as long as the dog is tall and is muscular. The tail is docked and erect, and the short coat is red, black, or chocolate. A signature characteristic of the Miniature Pinscher dog breed is a hackneylike stepping action, with the front legs lifting high and forward with each step. The coat needs weekly brushing with a soft bristle brush. The Miniature Pinscher is a high-energy dog with a fearless attitude and a curious intelligence. Without close supervision and vigorous daily exercise, these little dogs will get into trouble. All exercise should be on leash or within a fenced-in yard, as these small dogs like to chase small animals. Training is very important. Miniature Pinschers were bred to work, and training can help channel this work ethic. The training should be structured and firm yet fun. They love to play games and learn tricks. Miniature Pinschers also enjoy agility training. Socialization should begin early, too, as the breed is cautious with strangers. Miniature Pinschers can be very alert watchdogs. Min Pins today are companion dogs and need to spend time with people. They can, however, take advantage of a soft owner. Although most Miniature Pinschers like to play with children (the dogs enjoy the playfulness and busyness of kids), these dogs are very small and fragile. Play with children, especially small children, should be limited and closely supervised. Many breeders will not sell puppies to homes with small children. This breed can be aggressive with other dogs. Health concerns include luxated patellas, Legg-Perthe’s disease, and thyroid problems. Share your Miniature Pinscher story. Note: Upload only Miniature Pinscher picture or your picture with Miniature Pinscher below - spammer's ip may be blocked.